Oh my gosh…it’s been another insanely busy week at the veterinary clinic where I work!! Why is it that everyone’s beloved fur-babies seem to be getting sick at the same time?! At least I can report that our own little sweetheart Wolfie shows every sign of recovering from his mystery illness; he’s still getting antibiotics, and my husband is still syringe-feeding him…but he’s getting stronger and livelier every day!! And our new air conditioner was finally delivered, too; I’m less than thrilled with the jet-engine noise and that artificial chill…but my ferret daddy is waaay happier now that he no longer feels like he’s roasting in the close quarters of his closet-turned-office space!! P.S. If you haven’t yet checked out the Fun Fashion Friday link-up that happens every week at Fashion Should Be Fun, why not make today the day?! Love the colors in this dress on you, and you styled it perfectly. The flower chocker is so cool, I would wear that for sure, love the boots too! 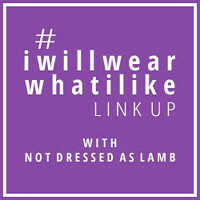 If you have time , would love for you to share your outfit on Turning Heads Tuesday linkup, it goes all week too. I'm so glad to hear that Wolfie is doing better, Dear. How could he not feel better when he looks at his hot mom?! Thanks so much for being such a great supporter of Fun Fashion Friday. Hope you're having a super weekend!